Half Persian 4 in 1 is one of the most difficult standard jewelry chains in existence. Because of this, many people who try to learn the weave will get one or two steps in, look at the tangled mess in their pliers, and give up. My best advice is to not do this. Keep going even if you think you're off, because you might well actually have it right; you just can't see that you have it right. Half Persian 4 in 1 works well with relatively large ring sizes. 14 gauge 3/8" ID, 16 gauge 5/16" ID, 18 gauge 1/4" ID, and 20 gauge 3/16" ID will all work well. I recommend starting with grossly oversized rings (e.g. 1/2" ID 14 gauge), because there are some very tricky ring placements in this weave. 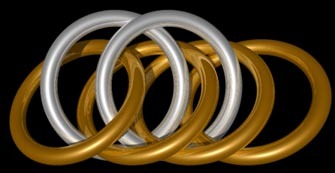 Step 1: Pass an open ring through three closed rings, and lay them out as shown. Be certain that the closed rings are lying as they are here; else you'll run into problems in the next step. Step 2: Pass an open ring through the ring on the right, from above. Then add a closed ring onto the open ring. Then pass the open ring through the remaining two closed rings, from below. This is the step with which most people have a lot of trouble. There's no real trick to doing it - you'll just have to practice. Step 3: Just a repetition of step two, really. 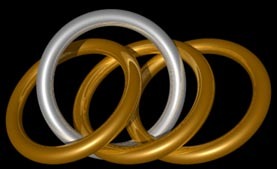 As before, pass the open ring through the ring on the right from above, add the closed ring, and pass the open ring through the two rings remaining, from below. That should do it! Remember, this is one of the most difficult of the common jewelry weaves, so don't expect to get it on the first try (if you do, well, more power to you).